Sun Ra said he came from Saturn. Known on earth for his inventive music and extravagant stage shows, he pioneered free-form improvisation in an ensemble setting with the devoted band he called the "Arkestra." Sun Ra took jazz from the inner city to outer space, infusing traditional swing with far-out harmonies, rhythms, and sounds. Described as the father of Afrofuturism, Sun Ra created "space music" as a means of building a better future for American blacks here on earth. 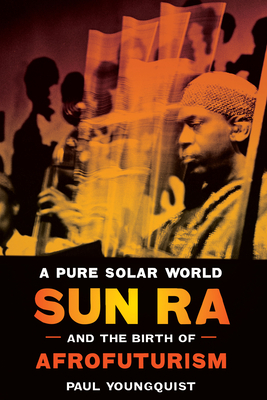 A Pure Solar World: Sun Ra and the Birth of Afrofuturism offers a spirited introduction to the life and work of this legendary but underappreciated musician, composer, and poet. Paul Youngquist explores and assesses Sun Ra's wide-ranging creative output--music, public preaching, graphic design, film and stage performance, and poetry--and connects his diverse undertakings to the culture and politics of his times, including the space race, the rise of technocracy, the civil rights movement, and even space-age bachelor-pad music. By thoroughly examining the astro-black mythology that Sun Ra espoused, Youngquist masterfully demonstrates that he offered both a holistic response to a planet desperately in need of new visions and vibrations and a new kind of political activism that used popular culture to advance social change. In a nation obsessed with space and confused about race, Sun Ra aimed not just at assimilation for the socially disfranchised but even more at a wholesale transformation of American society and a more creative, egalitarian world.